ABSTRACT Solid-phase peptide synthesis (SPPS) represents the standard for cGMP-peptide manufacturing. Recent improvements in chemistry & technology are highlighted. In the field of chemistry, scope and limitations for the application of innovative building blocks, e.g. pseudo-proline dipeptides, and the new coupling reagent COMU are summarized. On the technology side, the inverted filter centrifuge as a device to support large-scale final cleavage of the peptide from the resin is described. 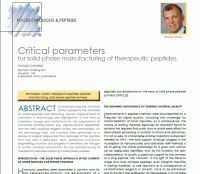 Both, additional innovative engineering solutions and progress in chemistry are thought to further increase productivity for the manufacturing of therapeutic peptides following a solid-phase process.